The evolution of state and regional transportation agencies is painfully slow in places like Missouri and Ohio, where officials are plowing ahead with pricey highway projects conceived of decades ago. But plenty of Midwesterners have different ideas for the future of their communities, and they aren’t shy about speaking up. One after another, residents of major Midwestern cities have challenged highway projects in recent months. People in Detroit, St. Louis, Milwaukee, Cleveland and Oklahoma City have reached the conclusion that spending hundreds of millions of dollars on road widenings might not be in their communities’ best interests. And it’s not just a few activists. Challenges have come from people like Council Member Ed Shadid in Oklahoma City, institutions like the Michigan Suburbs Alliance, and local governments like the city of Maplewood, just outside St. Louis. 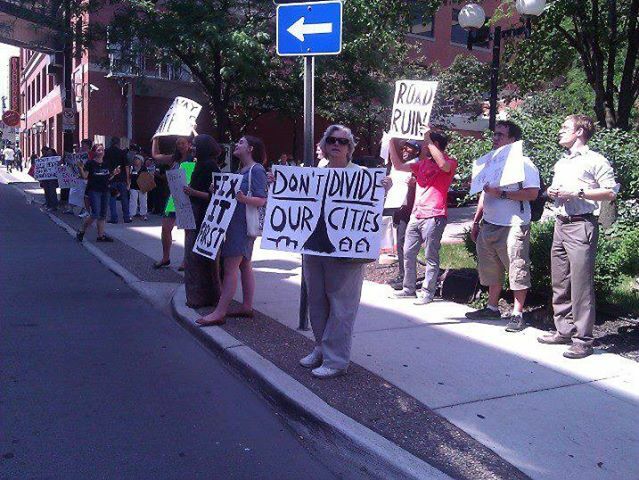 Detroiters held signs outside a meeting of their regional planning agency earlier this month, picketing plans for $4 billion worth of highway expansion projects. Though the Southeast Michigan Council of Governments ultimately green-lighted the plans, members of the agency had to sit through two hours of negative public comments first. Not only was the public moved to speak out, so were the city of Detroit and the county of Washtenaw, which officially opposed the project. And in Oklahoma City, the grassroots group Friends of a Better Boulevard has twice fought back state DOT plans to install a wide, highway-like boulevard in a developing area near the city’s downtown. As we reported this week, the FHWA recently intervened on the group’s behalf and forced ODOT to consider a proposal to restore the street grid instead of building a new road. Meanwhile, in Wisconsin, environmental and civil rights groups may soon obtain a court injunction against a $1.7 billion interchange outside Milwaukee, on the grounds that project sponsors did not consider its potential impact on sprawl and transit-dependent communities. And in Cleveland, a few scrappy activists and the Sierra Club are opposing a $100-million-per-mile roadway that would displace 90 families on the city’s southeast side. Jennifer Allen of the local advocacy group Trailnet said the highway project will potentially weaken investments the region has made in light rail and a comprehensive system of off-street trails. There are other problems as well. The traffic modeling used to justify the road is from 2002, before the driving slump began and when St. Louis had a larger population. How long will it be before the transportation authorities in this region catch up with the general public? I love it when conservatives say “we can’t afford” transit even as they ladle out billions for highway projects. It’s like saying we can’t afford vegetables because we’re spending too much on Doritos. In all fairness, conservatives are usually quantitatively illiterate and spend money like drunken sailors. I’m always shocked by the support of the trade unions for these expansions. Expansions just make the future overall maintenance bill bigger. And critical to union members’ concerns, lessen government’s ability to pay future pension and healthcare obligations. But as was seen in the run-up to the Tappan Zee Bridge boondoggle, the trade unions are key supporters. It shouldn’t be a surprise. Trade unions have to keep their members employed. Jobs now pay dues now, pay pension obligations now. The hope is that later projects will pay for the pension obligations down the line. What the elevated section of I-81 did to Syracuse was downright criminal. I love it when liberals say, “Since we’re already subsidizing highway users at the rate of a penny a trip, it’s only fair that we also subsidize transit riders at the rate of a dollar a trip.” It’s like saying the government is already giving us free water, it owes us free beer, too. John, we are going to spend twice as much on that single interchange we mentioned in Milwaukee than the federal government will spend on walking and biking throughout the United States this year. I think your assumptions are a little off. Who said anything about walking or biking? As a matter of fact, I believe walking and biking are legitimate parts of the highway, road and street landscape and they both ought to be safely accommodated on highways, roads and streets, wherever appropriate and at the expense of highway, road and street budgets. I apologize if anybody mistook my comment as saying otherwise. I applaud those who walk and bike for to get where they’re going! I define transit as including buses, trains and similar conveyances where the driver is paid, but not including walking or biking. Maybe the assumption that everybody uses that definition was my first mistaken assumption. What are my other assumptions that are a little off? My comment had to do with the tendency of some people who seem to feel entitled to public transportation that is paid by others–for example, people who seem to believe if ANYTHING is subsidized, EVERYTHING should be subsidized, no matter whether the benefits match the costs. My apologies if some liberals take offense at that. I was just having a little fun at Mark Walker’s expense. I was not impressed with either the Tax Foundation’s report or your predictable trumpeting of its erroneous results in January. Besides, it just supports my point. You use highway subsidies to rationalize transit subsidies. In this case, the supposed highway subsidies are phony. You’ll say its too old and I’ll agree. Transit supporters in Congress ordered this DOT study but, embarrassed by the results, forbade the DOT from doing it again. The point, Angie, is not whether roads or buses get more or less or even if they get their fair share of subsidies from general funds. The point is that transit gets a significant share of its subsidies from road users, out of the HTF. Transit groupies, like you and most of your lemming readers, instead of shouting a collective “THANK YOU!” to motorists everywhere, insist road users are getting too much and that you/they should get more! Putting aside for the moment indirect subsidies which amount to hundreds of billions annually, the numbers you give only apply to highways. Local roads are generally paid for with local income and real estate taxes which everyone pays, and yet there are generally no fees for using local roads. Mass transit at least charges users a fee to use it. There’s little doubt here in the US roads are massively subsidized compared to mass transit. Getting to indirect subsidies, motor vehicle travel causes pollution which in turn costs health care systems hundreds of billions anually. Moreover, deaths from transportation-related pollution number roughly ten times the number of deaths directly caused by motor vehicles. That’s about 300,000 people dying annually in the US alone, plus the 35,000 motor vehicles directly kill. These are huge costs which road users currently don’t have to pay. And then add in the costs of wars to secure oil supplies. In truth, these indirectly subsidies dwarf any direct subsidies by an order of magnitude, easily. Incidentally, I don’t necessarily feel subsidizing transportation is a bad thing. Quite the contrary, actually. A dollar put into transportation can return ten times that in taxes due to business activity. The caveat is subsidizing the appropriate transportation mode for the situation. Mass transit, walking, and cycling works far better in cities than private automobiles, and should therefore receive the bulk of transportation subsidies. In suburban areas you also need to fund commuter rail and some roads (but not as many as we currently fund). Rural areas are about the only places it makes sense for roads to get the bulk of the transportation subsidies, and then only if some type of essential activity (i.e. farming) is taking place in these rural areas. We don’t need to subsidize rural roads to housing subdivisions. If people want to live in really remote places like that, then let them pay the full cost of any needed roads. The irony here is the same people who complain about transit subsidies fail to realize roads are even more heavily subsidized on both an absolute and a per user basis. Moreover, if you really wanted to end subsidies, you would most likely end up with what we had about 100 years ago-rail transit serving anything the size of a small town or larger, and dirt roads in rural areas. Private autos would mostly be toys of the rich. And the suburbs would largely be havens for the wealthy as they were a century ago. One more thing-the topic of this article is about people in cities opposing highways running through these cities. Constructing highways in cities is enormously expensive. Moreover, it directly benefits only those who work in the cities and live in the suburbs. The highways actually have a negative effect on quality of life and property values in the city. Why should we have what amounts to a subsidy from the city to the suburbs for a mode of transport which is largely incompatible with cities? Funny how people who drive complain about “their” gas taxes being used to fund mass transit in cities but object when city residents don’t wish to spend enormous sums to accommodate their driving habit even in large cities. I hear nonsense like this all the time, such as a quote from someone who lives in Westchester complaining that bike lanes in NYC are making it harder for them to park their SUV. Last I checked someone from Westchester can easily take the train into NYC. NYC should be able to reapportion street space to benefit its residents rather than people who feel like driving in. How would someone who lives in Westchester feel if NYC wanted to extend a subway line right through their cul-de-sac? Well, that’s exactly how urban residents feel when state DOTs try to ram highways through their neighborhoods. More links available at Google [ freeway removal syracuse ]. He’s a total hack. Not even very good at pretending he’s legit. O’Toole said after Sandy NYC should replace its subways with an underground system of buses. That was probably the all-time dumbest thing ever said by anyone claiming any expertise in transportation. Unlike that whacko Obama, or his personal hack, LaHood, who want to spend gazillions of dollars we don’t have building high speed trains we don’t need, that would crisscross vast empty spaces to connect 80 percent of Americans, who are already connected by highways and airplanes. Nothing nutty about that, is there? Yeah, you’re right, the idea that America would have the same quality of infrastructure Europe and Asia really is cray! What could it hurt for America to be a little more like Spain and Greece, eh? I’m curious. What part of my post did you miss? The gazillions we don’t have or the trains we don’t need? The gazillions we don’t have that we’re going to spend on highways that we don’t need. Agreed. We shouldn’t spend money we don’t have on highways we don’t need. My GRACIOUS, Angie! “John Dough” just won’t go away! I’d like to thank you for this article and for all your work on the Streetsblog site – and everything else you do to help bring our transportation system back into a state of equilibrium.